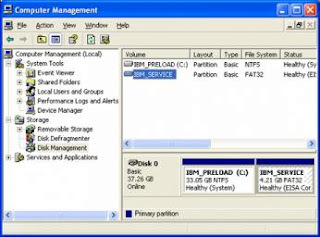 "Over time and with regular use, files and folders on a computer's hard drive break down or become fragmented. When computer files are fragmented, they are typically disorganized and in the wrong place. This can cause the system to run slowly and to experience processing problems. For the solution of this problem we can apply defragmentation process to improve retrieval time and the computer's overall performance"
A process that reduces the amount of fragmentation by physically organizing the contents of the mass storage device used to store files into the smallest number of contiguous regions (fragments) for the maintenance of file system. Defragmenting the computer gathers and organizes the files, which usually improves retrieval time and the computer's overall performance. From the ‘Start’ menu, select ‘All Programs’, ‘Accessories’, ‘System Tools’ and then click ‘Disk Defragmenter’. In the window that opens, you should see the following image. Click on the ‘Defragment’ button. Alternately, you can click the ‘Analyze’ button. It will scan the disk and give you an idea of how much space you would gain if you defrag. A notification will pop up when the process is finished. Vista is slightly different. It doesn’t have much of an interface. Also, you can schedule the defragger to run. This wasn’t available in Windows XP. Like, XP, you can find the defragger in System Tools. From the start menu, click ‘All Programs’, ‘Accessories’, ‘System Tools’ and then click ‘Disk Defragmenter’. The following window will pop up. Click the ‘Defragment Now’ button. You can also schedule the defrag to take place at a future time by using the scheduling options. Make sure the ‘Run on a Schedule’ check box is selected. Then click on the ‘Modify Schedule’ button and select the schedule that suits you. Select the disk to defrag and click ‘Ok’. 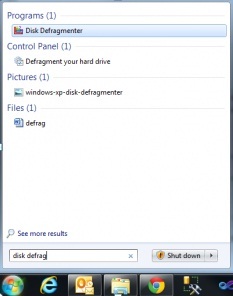 The easiest way to access the Disk Defragmenter is to click on the start button. In the search field, type ‘Disk Defragmenter’. The following should pop up in your menu system. Click on the ‘Disk Defragmenter’ option. The following window will pop up. Notice the interface is completely different. In the middle of the screen, you can see a list of drives available to defrag. Select the disk you wish to defrag. This will typically be your ‘C’ disk. Click the ‘Defragment Disk’ button. If at any time you need to stop the process, you can click the ‘Stop Operation’ disk in the window without damaging your PC. 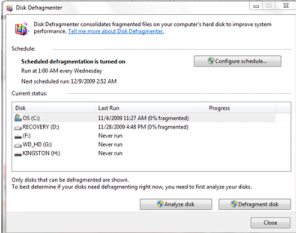 Alternately, you can schedule the defrag like you can in Vista. With the defragger open, click ‘Configure Schedule’. Make sure the ‘Run on a Schedule’ option is checked, select your schedule and disk and click ok. I do not even understand how I ended up right here, however I thought this post was good. blogger in the event you aren't already. Cheers!